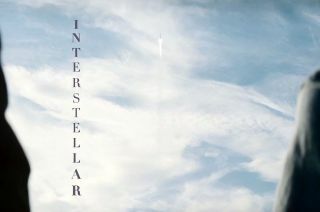 Title screen from the first teaser trailer for "Interstellar," the 2014 science fiction film by director Christopher Nolan. Alan Shepard, Neil Armstrong and the space shuttle Atlantis make cameos in the first teaser trailer for "Interstellar," the highly-anticipated 2014 science fiction film from director Christopher Nolan. The two-minute clip features actor Matthew McConaughey narrating a series of scenes mostly borrowed from NASA's history. "We count these moments ... when we dared to aim higher, to break barriers — to reach for the stars," McConaughey says. "To make the unknown known." Other archival NASA footage shows the Gemini 2 capsule falling back to Earth as audio from the Gemini 6 mission plays, and the Apollo 12 lunar module "Intrepid" beginning its descent to the moon as Armstrong's famous "one giant leap" is heard in the "Interstellar" teaser trailer. "We count these moments as our proudest achievements, but we lost all that," McConaughey says. His words are matched with footage of the orbiter Atlantis launching and then landing on the final flight of the space shuttle program. NASA mission commentator Rob Navias can be heard describing Atlantis' touchdown. "Having fired the imagination of a generation ... [the space shuttle] pulls into port for the last time," Navias said. The video then goes black, fading into a scene of an old sci-fi style rocket model sitting on a bookshelf. "Perhaps we've just forgotten that we are still pioneers," McConaughey says, "that we've barely begun and that our greatest accomplishments cannot be behind us, that our destiny lies above us." The first American astronaut in space Alan Shepard, as seen in the trailer for Christopher Nolan's "Interstellar." The film opens in theaters in November 2014. And with that, the trailer comes to an end with two people watching a distant rocket lift off from over the horizon of a corn field. The movie's title is displayed vertically, tracing the path of the launch. The teaser doesn't reveal much, if anything, about the plot of "Interstellar," which will be released by Paramount and Warner Brothers in November 2014. The movie is Nolan's first since completing "The Dark Knight" trilogy of Batman films last year. A synopsis released by Paramount describes "Interstellar" as following a "group of explorers [making] use of a newly discovered wormhole to surpass the limitations on human space travel and [to] conquer the vast distances involved in an interstellar voyage." Theoretical physicist Kip Thorne of the California Institute of Technology (Caltech) is credited with the story, which is based on his theories of gravity fields and wormholes. In addition to McConaughey, who plays Cooper in the film, "Interstellar" stars Anne Hathaway, Jessica Chastain, Bill Irwin, Ellen Burstyn and Michael Caine. John Lithgow and Matt Damon are also in the film. Click through to collectSPACE.com to watch the first teaser trailer for director Christopher Nolan's "Interstellar."